Months and months of training lead up to one of the most prestigious one-man (or woman) outrigger canoe paddling races in the world, the Ka‘iwi Channel Solo World Championship. Athletes from Hawai‘i and across the world paddle from the island of Molokai to Oahu in the Ka‘iwi Channel, whose name carries the meanings of its two core words “the bones.” The channel is said to be one of the most treacherous bodies of water and depending on the ocean conditions top paddlers finish between 3 1/2 and 6 hours. Paddlers spend hours and hours each week training to physically prepare their bodies and minds for the race but equally important is the refueling that takes place off the water. 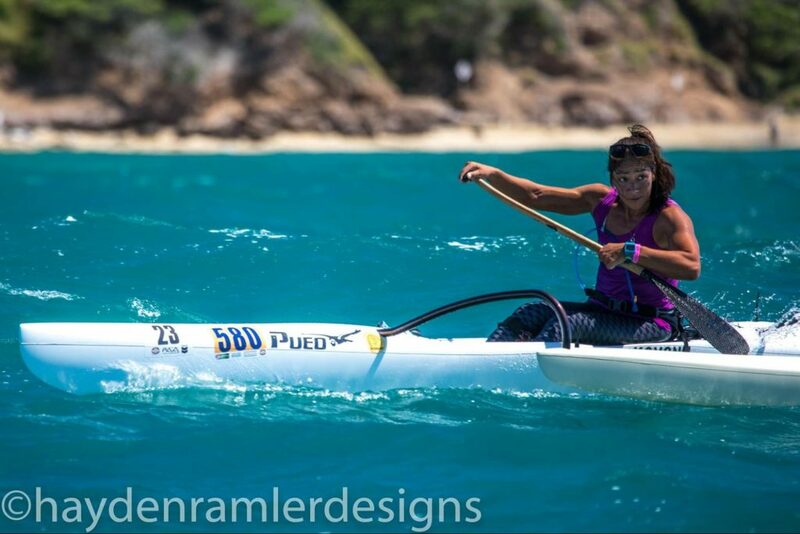 Each paddler will say they have their own “secret” training nutrition plan which may consist of a specific food or drink they prefer, but the bottom line is that the energy from carbohydrates, protein, and fat they ingest is required to fuel their body for training, recovering and repairing so they are able to continue to perform at high levels. Having a nutrition plan for race day is equally important for achieving peak performance and there are all sorts of products available with claims about digestibility, energy-sustenance, and promises of optimal performance results. Even with all of these highly specified and formulated products many paddlers prefer to rely on what fueled Native Hawaiians and other ancient voyager, poi. Poi, made of watered down pa‘i‘ai or mashed kalo (taro) was considered a voyaging staple and for many paddlers it continues to be. This easily transported food contains water that supports hydration, energy-rich carbohydrates, and for some serves as a connection to their voyaging ancestors, making it a “go-to” for many paddlers as they cross the Ka‘iwi Channel. Energy is essential to life. Normal function of the human body requires a constant input and output of energy to maintain life. Various chemical components of food provide the input of energy to the body. The chemical breakdown of those chemicals provides the energy needed to carry out thousands of body functions that allow the body to perform daily functions and tasks such as breathing, walking up a flight of steps, and studying for a test. In food and in components of the human body, potential energy resides in the chemical bonds of specific molecules such as carbohydrates, fats, proteins, and alcohol. This potential energy is converted into kinetic energy in the body that drives many body functions ranging from muscle and nerve function to driving the synthesis of body protein for growth. After potential energy is released to provide kinetic energy, it ultimately becomes thermal energy or heat. You can notice this when you exercise and your body heats up. The amount of energy in nutrients or the amount of energy expended by the body can be quantified with a variety of units used to measure energy. In the US, the kilocalorie (kcal) is most commonly used and is often just referred to as a calorie. Strictly speaking, a kcal is 1000 calories. In nutrition, the term calories almost always refers to kcals. Sometimes the kcal is indicated by capitalizing calories as “Calories.” A kilocalorie is the amount of energy in the form of heat that is required to heat one kilogram of water one degree Celsius. Most other countries use the kilojoule (kJ) as their standard unit of energy. The Joule is a measure of energy based on work accomplished – the energy needed to produce a specific amount of force. Since calories and Joules are both measures of energy, one can be converted to the other – 1 kcal = 4.18 kJ. The energy contained in energy-yielding nutrients differs because the energy-yielding nutrients are composed of different types of chemical bonds. The carbohydrate or protein in a food yields approximately 4 kilocalories per gram, whereas the triglycerides that compose the fat in a food yield 9 kilocalories per gram. A kilocalorie of energy performs one thousand times more work than a calorie. On the Nutrition Facts panel found on packaged food, the calories listed for a particular food are actually kilocalories. Estimating the number of calories in commercially prepared food is fairly easy since the total number of calories in a serving of a particular food is listed on the Nutrition Facts panel. If you wanted to know the number of calories in the breakfast you consumed this morning just add up the number of calories in each food. For example, if you ate one serving of yogurt that contained 150 calories, on which you sprinkled half of a cup of low-fat granola cereal that contained 209 calories, and drank a glass of orange juice that contained 100 calories, the total number of calories you consumed at breakfast is 150 + 209 + 100 = 459 calories. If you do not have a Nutrition Facts panel for a certain food, such as a half cup of blueberries, and want to find out the amount of calories it contains, go to Food-a-pedia, a website maintained by the USDA. For more details on food composition data, go to the USDA Food Composition Databases page. Energy is required in order to build molecules into larger macromolecules (like proteins), and to turn macromolecules into organelles and cells, which then turn into tissues, organs, and organ systems, and finally into an organism. Proper nutrition provides the necessary nutrients to make the energy that supports life’s processes. Your body builds new macromolecules from the nutrients in food. Energy is stored in a nutrient’s chemical bonds. 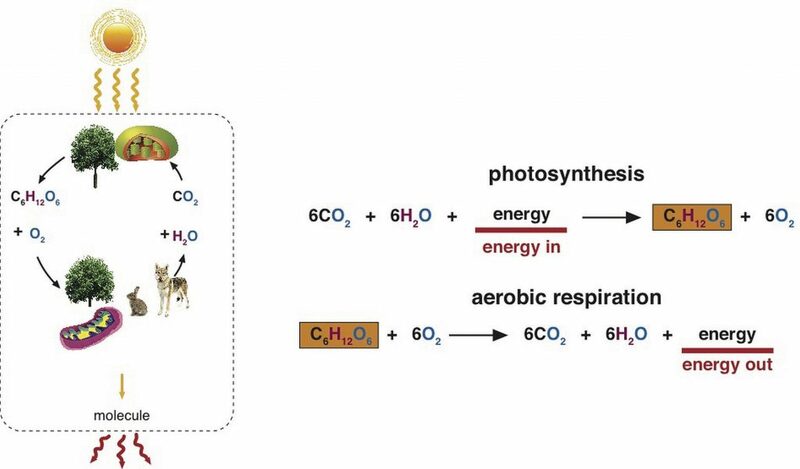 Energy comes from sunlight, which plants capture and, via photosynthesis, use it to transform carbon dioxide in the air into the molecule glucose. When the glucose bonds are broken, energy is released. Bacteria, plants, and animals (including humans) harvest the energy in glucose via a biological process called cellular respiration. In this process oxygen is required and the chemical energy of glucose is gradually released in a series of chemical reactions. Some of this energy is trapped in the molecule adenosine triphosphate (ATP) and some is lost as heat. ATP can be used when needed to drive chemical reactions in cells that require an input of energy. Cellular respiration requires oxygen (aerobic) and it is provided as a byproduct of photosynthesis. The byproducts of cellular respiration are carbon dioxide (CO2) and water, which plants use to conduct photosynthesis again. Thus, carbon is constantly cycling between plants and animals. Plants harvest energy from the sun and capture it in the molecule glucose. Humans harvest the energy in glucose and capture it into the molecule ATP. One measurement of food quality is the amount of nutrients it contains relative to the amount of energy it provides. High-quality foods are nutrient dense, meaning they contain lots of nutrients relative to the amount of calories they provide. Nutrient-dense foods are the opposite of “empty-calorie” foods such as carbonated sugary soft drinks, which provide many calories and very little, if any, other nutrients. Food quality is additionally associated with its taste, texture, appearance, microbial content, and how much consumers like it.